I am a Research Experience for Undergraduates intern here at Bigelow Laboratory for Ocean Sciences. This summer, I have the privilege of working alongside Senior Research Scientist Douglas Rasher and Postdoctoral Fellow Matthew Suskiewicz. Our project focuses on something big — literally. Kelp forests! You might be asking — why kelp forests? Great question! Well, kelps are cold water macroalgae that behave like the plants we are all familiar with. In fact, their general structure is extremely similar to terrestrial plants (see below). 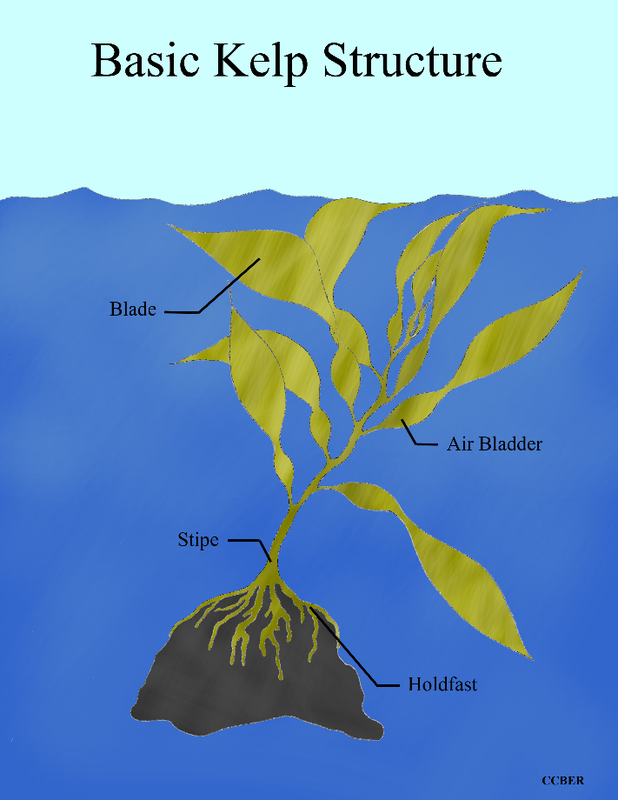 The holdfast acts like the roots of a traditional plant — anchoring the kelp to the rocky ocean floor. Next is the stipe, basically the stem. Exiting the stipe are the blades — the long leaves that you may see swaying with the ocean currents. Basic structure of kelp—the cold water macroalgae known as the Laminariales (Source: UC Santa Barbara). Kelps are primary producers, meaning they make their own food using energy from the sun, and by doing so, they provide much of the oxygen and nutrients to our oceans. As primary producers, kelps need to be as close to sunlight as possible. For this reason, they are mainly confined to near shore waters. Kelps prefer cold, nutrient-rich, and clear waters in habitats with rocky bottoms that enable their holdfasts to stay in place. 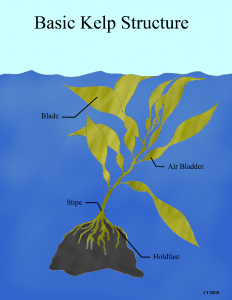 If these conditions are met, kelp can grow from the ocean floor all the way up to the surface! When multiple kelps grow together — producing an underwater forest — they provide dynamic three-dimensional habitats that serve as a home for many ocean critters (see the picture below). 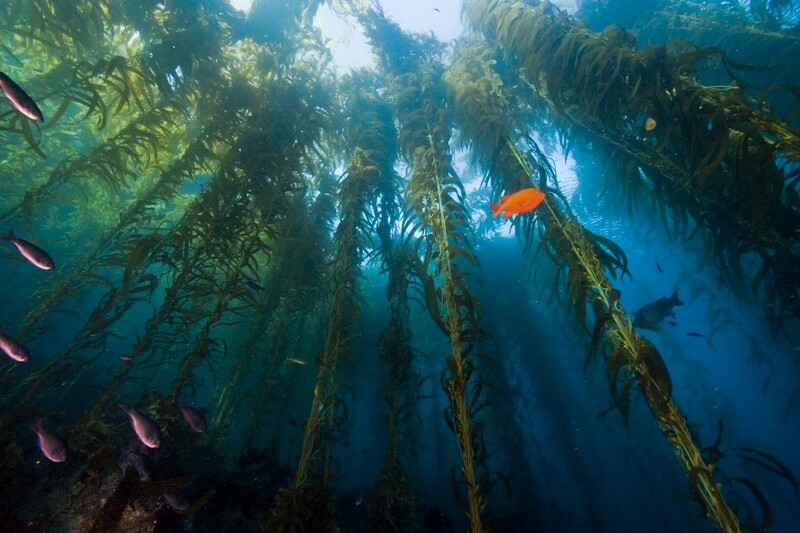 Underwater kelp forests are home for many species (Source: coastalenvironments.com). For example, many herbivores — organisms that eat plants and algae — visit the kelp forests for food. Also, these forests act as nurseries for juvenile fish, shellfish, and crustaceans, and feeding grounds for predators who prey upon forest taxa. Some animals that can be found in a healthy kelp forest include large predatory fish, various invertebrates, marine mammals, sharks, visiting seabirds, and many more! So, now that we have covered the basics of what kelp forests are and why they are important, what exactly is the Rasher Lab studying? We are researching the status of kelp forests in the Gulf of Maine today and comparing the results to historical data. Sadly, kelps are extremely sensitive to both biotic and abiotic pressure. A combination of overfishing by humans — leading to the removal of important ecosystem members — and changes to the ocean environment — especially rapid warming — caused abrupt declines in kelp forests beginning in the mid-20th century. Without healthy kelp forests around to provide food and shelter, Maine’s coastal ecosystems suffered. However, it appears that kelps may be returning to the area. Although humans contributed to the initial loss of kelp, we may also be lending a helping hand in their return. In the 1990s, we replaced the large predatory fish that had once controlled the kelp forests ecosystems. 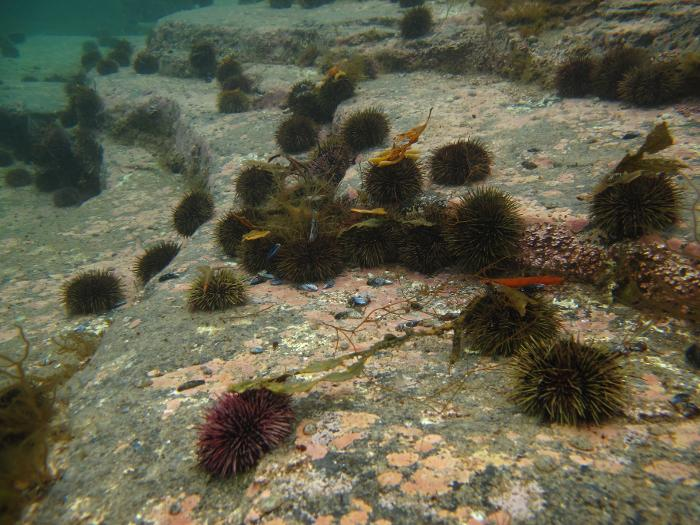 By helping to remove the herbivores that were having a feeding frenzy on the kelp — the green sea urchins — we have eliminated some of the stress on kelps in the area. “Urchin barrens” produced by green sea urchins in the absence of predators (Source: www.phys.org). 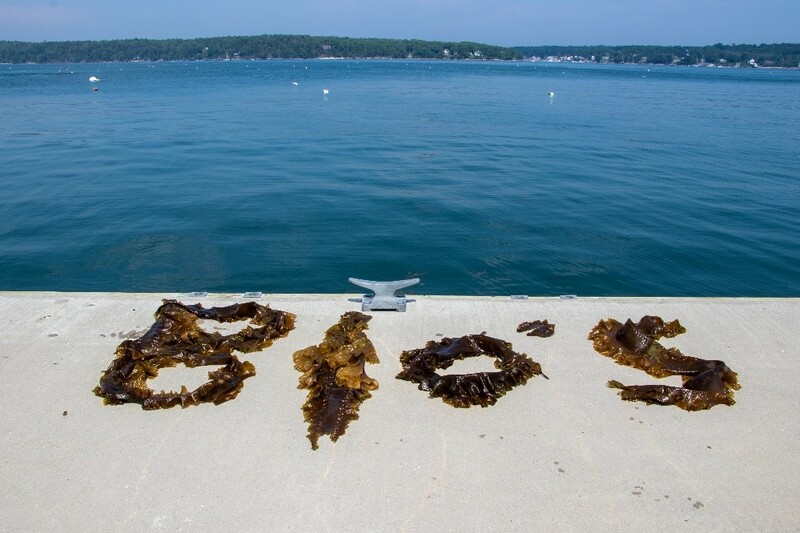 Our research aims to answer some important questions regarding kelps’ return to the Gulf of Maine. For instance, where are we seeing kelps return? What species are present today? How quickly are the forests being established? And how do such metrics compare to those of historic times? To answer these questions, we are going into the field to sample various sites throughout the region. We take samples of kelp and other algal species to determine the composition of today’s forests. Also, we measure the size and weight of individual organisms and groups in order to make overall biomass estimates. 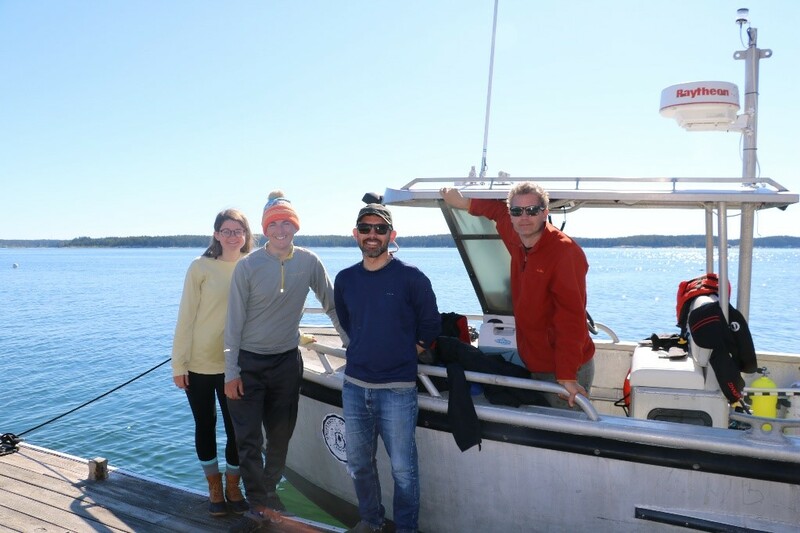 Members of the Rasher Lab out on a recent research cruise to sample various sites in Penobscot Bay, ME. From left: Myself, fellow intern Shane Farrell, Dr. Douglas Rasher, and Dr. Thew Suskiewicz. 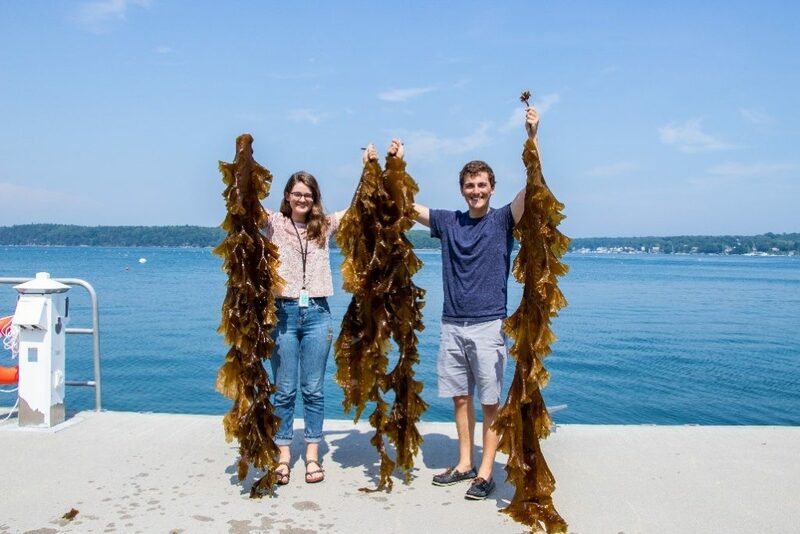 Myself and Shane holding some of the large kelp being observed in the Gulf of Maine (Source: Reggie Huang, Communications Intern; Bigelow Laboratory for Ocean Sciences). We are hoping to see the re-establishment of healthy kelp forests in the Gulf of Maine in the near future and, once we know the state of these forests today, we can begin conservation and ecosystem-based planning. Our data will also enable policy makers, scientists, and the local government to determine areas of interest or concern. Armed with this knowledge, we hope to prevent future harm to this essential ecosystem. I hope that this post has helped you gain an understanding and appreciation of the important role that kelps play in maintaining a healthy ocean ecosystem. Courtney Stuart is a Stony Brook University student in Bigelow Laboratory for Ocean Science’s Research Experience for Undergraduates program. This intensive experience provides an immersion in ocean research with an emphasis on hands-on, state-of-the-art methods and technologies.